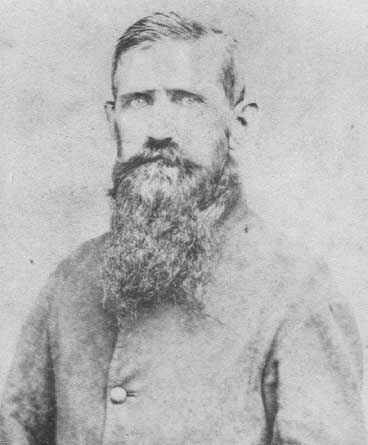 Photo: Enos McDonald, Kerr-Drill's only known Civil War veteran: Company E, First Ohio Volunteer Infantry, organized in Dayton in the Fall of 1861. He died at age 44 of a disease contracted while serving in Tennessee. He was married to Sarah Jane Reed, who is buried in Dayton's Willowview Cemetery. His son George W. McDonald's homestead was on Old 25 near Needmore Road. In 1838 David and Sydney A. Smith Dickensheets left Frederick County, Maryland to settle in Harrison Township, Montgomery County, Ohio. David was born in 1801 and is the son of Frederick William and Nancy Dickensheets. Sydney was born in 1812 in England. They were married on Feb 4, 1831 in Frederick County, Maryland. David Died on June 9 1871 and Sydney died on September 26, 1852. Both are buried in the Kerr Cemetery. David purchased land along the Stillwater River and was the owner of a gristmill there. David and Sydney were the parents of eleven children: John, Mary E., William, Frederick, David, Nancy J, Samuel, Parmelia Ann, Margaret Ann (buried in Kerr next to her parents), Ann Rebecca, Elizabeth. George and Jemima Lakins Drill left Frederick County, Maryland in 1828 and settled in Harrison Township, Montgomery County, Ohio. George made the migration in a four-horse wagon and a one-horse carriage called a rockaway. He purchased 160 acres of land that was mostly Stillwater bottomland and cleared ten acres of timber for his homestead. Located on this acreage is the Drill Cemetery where both George and Jemima are buried as well as other family members. George and Jemima were Protestant Episcopal by faith and the Ebenezer Methodist Episcopal Church was built on his land. George was a veteran of the War of 1812. George was born October 7, 1787 and died on January 26, 1835. On November 13, 1813 he married Jemima Lakin in Frederick County, Maryland. Jemima was born on December 6, 1791 in Frederick County, Maryland and died on June 23, 1860. To this union were born nine children: Thomas, Daniel Lakin, Elizabeth, George Washington, Jacob Andrew, Sarah Ann, John William and Anne Rebecca. In 1818 James and Susanna Lodge Ensley and family left Bedford County, Pennsylvania for Ohio. Upon arrival they settled in Butler Township, Montgomery County. Here he built a log cabin and farmed 160 acres and at the time of his death he owned 300 acres. James and Susanna were the parents of four children: Roseanna, George, Elizabeth and Joseph Lodge. The Ensley families were members of the Methodist Episcopal Church and he served as justice of the peace for a number of years and held other township offices. Joseph Lodge Ensley, the son of James and Susanna Ensley married Ann Rebecca Drill, daughter of George and Jemima Drill, on December 18, 1849. To this union were born six children, Elizabeth (buried in the Drill Cemetery), Mary, Martha, James C., Benjamin Franklin and Rose A. The Joseph and Ann Ensley as well as their children's families were all members of the Methodist Episcopal Church with Joseph being a Trustee. Smith and Sarah Ramsey Gregg Senior migrated to Shakertown, Van Buren Township, Montgomery County, Ohio in 1797 leaving Pennsylvania. In 1814 he removed to Butler Township, Montgomery County, Ohio. The history books state that Smith in 1815 was a Quaker Minister and that he was a veteran of the War of 1812. Smith was born in 1772 and died on April 15, 1852 in Montgomery County, Ohio and is buried in the Kerr Cemetery. Smith and Sarah Gregg were the parents of twelve children: James, Martha, Margaret, John, William E., D.H., Andrew, Smith Jr., Julia Ann, Elizabeth and Sarah. Smith Gregg Jr. was also a Quaker minister in Union Township, Miami County, Ohio. Robert Huey born about 1755 married Agnes Elliott and were the parents of the following children: Samuel, Mary, Margaret, Nancy, Thomas, and Albert Russell. All of Robert's children except for Albert Russell were born in Pennsylvania. Albert Russell was born in Virginia. The year that Robert settled in Ohio is not for certain but he is found in the Montgomery County marriage records where on June 5, 1804 he married Lydia McFarland. Various records show that Mary, Margaret and Albert Russell all accompanied their father to Ohio. Samuel moved to Boone County, Kentucky and became a frontiersman with Daniel Boone. Mary married John Riggs. In 1822 John drowned in the Miami River. They were the parents of six children: Leatha, Lucinda, Delilah, Samuel, John and Mary. Mary married John Christopher Folkerth on June 5, 1804 in Montgomery County, Ohio. John was the son of Christopher and Margaret Folkerth. He left Frederick County, Maryland to settle in Montgomery County. John was quite active in the political life in Montgomery County. He served continuously for fifty-two years as the Justice of the Peace for Dayton Township. In 1807 he was elected County Commissioner and then in 1809 he was elected Mayor of Dayton. John and Margaret had four children: Louisa, Albert Russell H, Rebecca, and Margaret. Albert Russell Huey was born on March 8, 1785 in Virginia and died on August 3, 1867 and is buried in the Kerr Cemetery. On September 5, 1809 Albert married Margaret Reed, daughter of John and Sarah McCann Reed. To this union were born four children: James, Elliot, Sarah, and Margaret. Joseph Kennedy accompanied his father, Gilbert, in 1808 when they relocated to Montgomery County, Ohio from Pennsylvania. Upon arrival Joseph Kennedy purchased forty acres of land and erected a distillery. At the time of his death Joseph owned 300 acres of land. Joseph married Nancy Kerr, daughter of John and Ruth Mahall Kerr Senior. To this union five children were born: Martha, Gilbert, Ruth (buried in Kerr Cemetery), John and Joseph. William Kennedy also a son of Gilbert purchased his land in 1805 and President James Madison signed his deed. In 1812 he became a surveyor of Montgomery County and in 1818 he was elected Justice of The Peace serving for eight years. In the winter of 1812 and 1813 he surveyed a road from Eaton, Ohio to Vincennes, Indiana. In January 10, 1810, William married Martha Sloan, daughter of John and Elizabeth Rammage Sloan. To this union four children were born: Joseph, Jane, James and Margaret. Everyone in this family except for Margaret is buried in the Kerr Cemetery. 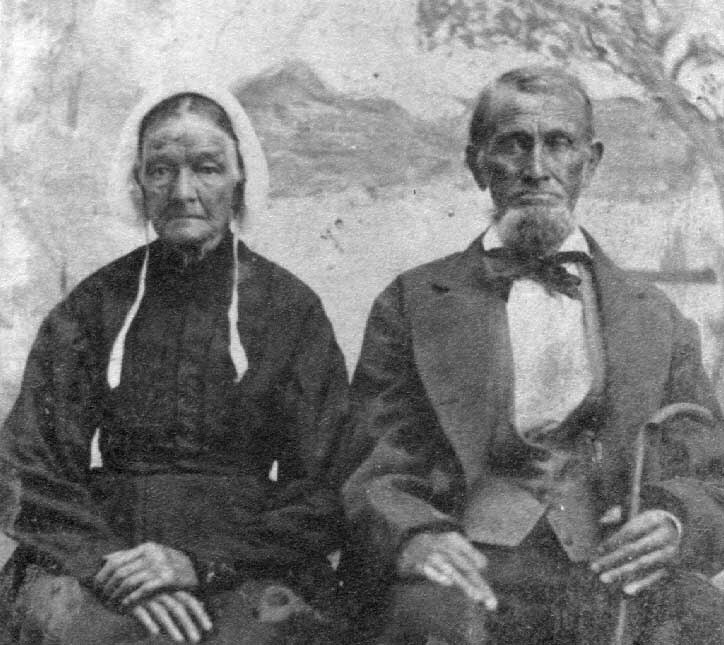 John and Ruth Mahall Kerr Senior left Wellsville, Virginia in 1809 and settled on a farm in Harrison Township, Montgomery County, Ohio. John was born on June 18, 1771 and died on May 11, 1847 and in buried in Kerr Cemetery. This cemetery is located on land that he owned. Ruth Mahall Kerr was born on January 29, 1776 and died on August 7, 1827 and is buried in Kerr Cemetery. To this union were born five children: James Madison, John Jr., William, Syrenia and Nancy. John Kerr served as a Justice of the Peace in Montgomery County. When Conklin Miller first settled in Ohio is uncertain but in 1807 we find him purchasing land in the town of Dayton. On May 21, 1816 Conklin married Mary Paul in Montgomery County. Conklin and Mary Paul Miller were the parents of eight children: Ephriam, William B., Samuel A., Hannah, Sarah, Martha, Henry and Emily. Conklin died in 1844 in Montgomery County, Ohio. Ephriam Miller married Margaret Huey on March 26, 1849 in 1849 in Montgomery County, Ohio. Margaret was the daughter of Albert and Margaret Reed Huey. Ephriam died on May 30, 1855 and is buried in the Kerr Cemetery next to his in-laws. John Reed, his family, and several other families moved to Dayton in 1806. They fled Kentucky with their minister David Purviance (who was connected with the Cane Ridge Revival) to get away from slavery. John's son was William, and his grandson Martin. William was a farmer, and Martin a cooper. All were active Methodists. We don't know where John, William and Martin are buried. Kerr Drill contains the graves of their siblings and children, and William's wife Sallie, the last known burial. The Reed farm was just north of the cemetery. The Reeds and Kerr's had neighboring farms in Northridge (Dayton). The Reeds were founding members of Ebenezer Methodist Church (now known as Victory Methodist Church). James and Rebecca Drill Rice left Frederick County, Maryland and arrived in Ohio in 1826. James and Rebecca first settled in Ross County, Ohio and then several years later relocated to Van Buren Township, Montgomery County, Ohio. Rebecca Drill Rice was the sister of George Drill. James was a miller and farmer by profession. James and Rebecca were both members of the Episcopal Church. They were the parents of six children: Jacob Benjamin Fleming, James Andrew, Louisa Ann, John William, George Kellenberger and Milton. After Rebecca's death in on February 24, 1835 James remarried Nancy Phillips and they were the parents of one child: Rebecca, who died in infancy and is buried in the Drill Cemetery beside James and Rebecca Drill Rice. James Andrew Rice son of James and Rebecca Drill Rice married Hannah Opdycke on September 16, 1847. Hannah was the daughter of Albert and Rebecca Reeder Opdycke, both families being early residents of Montgomery County. James and Hannah were the parents of eleven children: James Milton who died in infancy and is buried in the Drill Cemetery, Charles Wesley, Albert Clinton, Oliver Hazard, Newton Harry, Infant Daughter, Wilson, William Pierce, Edgar Elmer, Emma May and Lillie Olive. John and Elizabeth Rammage Sloan settled first in Steubenville, Ohio and then afterwards removed to Montgomery County where he purchased 160 acres of land in Butler Township. Elizabeth died in 1832 and John in 1833. John and Elizabeth were Quakers. They were the parents of eight children: Martha, Martin, Jane, Mary, Elizabeth, John M., William, and Sarah. Martha Sloan married William Kennedy, son of Gilbert Kennedy who was discussed previously. John Sloan Jr. married Rebecca Hosier on October 21, 1830. John died on August 3, 1851 and is buried in the Kerr Cemetery. Rebecca died on July 11, 1843 and is buried in the Kerr Cemetery.